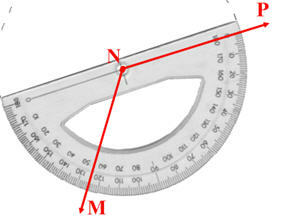 Learn how to use a protractor when measuring angles. An angle is formed by two rays with a common endpoint called the vertex. 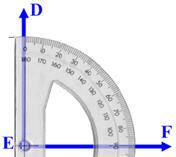 The most common unit used when measuring angles is the degree. 1) Place the center of the protractor on the angle's vertex. 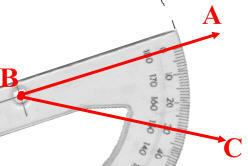 2) Rotate the protractor so that the straightedge is placed over one of the angle's sides. 3) Use the scale that begins with zero. Read where the other side of the angle crosses this scale. Angles can be classified based on their measure. An acute angle measures between 0 and 90 degrees. The angle in this picture has 30 degrees, therefore it is acute. A right angle measures 90 degrees. The angle in this picture has 90 degrees, therefore it is right. An obtuse angle measures between 90 and 180 degrees. The angle in this picture has 125 degrees, therefore it is obtuse. A straight angle measures 180 degrees.